Halloween, much like Christmas, Easter and other holidays, has changed a lot in my lifetime. Children look forward to these holidays for very different reasons than we as adults do; for them, all three are usually fun and associated with activities that center around themselves; presents at Christmas, Easter egg hunts at Easter; Trick-or-Treating and enough candy to keep the family dentist in business at Halloween. As I became an adult and afterwards, my enjoyment of Christmas and Easter took on different directions, those of spirituality, worship, family time, giving and fellowship with friends…but Halloween became more of a memory because I didn’t celebrate it anymore as the childhood connection to the day was left in the past. I have discovered however, in recent years, that Halloween can come back to you when you have children of your own and I have come to enjoy that holiday again because of the excitement that my son experiences when it comes around. The reason I remember the Halloween’s of the past so well is because of the effort that my parents and many other parents in our community put into the event to make it a fun, special time for all of us. There was so much more to it than just going to the store and buying candy to dole out to the trick-or-treaters that came by; they actually planned things ahead of time for us to do, really making the entire week of Halloween a fun and festive occasion. Our main obligation as kids was the necessity of an appropriate costume and much thought and deliberation went into the choice of just the right one because once it was settled upon, located and purchased, there would be no going back. How were we to represent ourselves to the public that we would come into contact with during the week of the Big Event? What costume was certain to win points with those that doled out the goods, thus ensuring a richer harvest of candy? Had our intelligence network uncovered anyone else who might be considering the same costume? There was nothing worse than showing up for an event in your costume and seeing someone else wearing the exact same thing. Was our costume character currently trending high on the coolness charts or were they yesterday’s news? These were big and important decisions that occupied our minds as the month of October rode in on the cooler winds of autumn. When I was seven years old, the same age my son is today, we had a range of larger-than-life characters to choose from. There was always the “Super Friends”: Superman, Batman (and Robin) and Aquaman. The girls were limited to Wonder Woman and Cinderella but didn’t seem to mind too much. The show was in its first season that year and the highlight of every Saturday morning was hearing actor Ted Knight’s commanding voice opening the show with “In the Great Hall of the Justice League, there are assembled the world’s four greatest heroes….”. With those words, a great adventure was about to begin and this show was guaranteed to provide imagination fodder to keeps us busy saving the neighborhood from the forces of evil all week long. Other characters, such as Spider Man, Captain Marvel (aka Shazam) and The Hulk were also thrown into the mix, providing my best friend and me with many discussions and debates over whether Superman was actually stronger than Captain Marvel. I don’t think this argument has ever been resolved by those knowledgeable about such things. Evil Knievel, the legendary motorcycle stuntman was another favorite of those years, along with the Six Million Dollar Man (“Steve Austin, astronaut…a man barely alive….we can rebuild him….we have the technology…. ), firefighters John Gage and Roy Desoto from “Emergency” and even the old standbys such as cowboys, wizards and so forth. Any of these might rate high on our list of proper characters to serve as our Halloween alter-egos and after much discussion and sometimes, the flip of a coin (useful when two of us wanted to be the same character), it was time to secure the costume. Back then, few people in Georgia had ever heard of Wal-Mart so you had three choices: Beckham’s Five and Dime store, the K-Mart in neighboring Griffin or else someone made your costume. Typically, Mom would load us up in the car about a week or two before Halloween and take us over to Griffin where K-Mart which had a tremendous choice of costumes to choose from. We usually could find exactly what we were looking for there and going early meant we had the best selection. Halloween costumes have improved a lot since I was a kid; back then, you were lucky if the costume held together for more than three events; today they can actually be washed and used again, providing many weeks of post-Halloween fun for the kids. They were typically made of a shiny polyester material similar to what graduation gowns are made from today and you had to be careful wearing them because the material was very easy to snag or tear. Completing the look was a very thin, molded plastic mask designed to fit the contours of your face. Openings for the eyes, nose and a slit for the mouth were cut into the mask and this was held in place by a rubber band that was stapled to the sides of the mask by the ear. This too you had to treat with care as the mask was easy to crush and the rubber band was likely to break if you tugged on it too much. Once the annual costume ritual was completed, it was time to celebrate Halloween week and this is where our parents really shined. The small private school I attended used to have an annual carnival where each of the classes did something different. You started at the 1st grade classroom and worked your way around the school, stopping in each classroom to try something different. In one you might go “fishing” for prizes, bobbing for apples in another, even Bingo in another classroom. The older grades usually had some kind of haunted house set up or at least something to entice you out of your quarters in their classrooms. After you had made your rounds and loaded yourself up with cheap plastic giveaways and candy, it was time to head to the kindergarten room which was where the cake walk was held. This was basically a game of musical chairs that both kids and parents participated in, with the goal to win one of several homemade cakes baked by people who knew how to do it right. The Halloween carnival was always a lot of fun. Another fun thing we did for Halloween was getting to help the Jaycees with their annual Haunted House fundraiser. The Jaycees would usually secure some dilapidated old house that was slated for demolition, usually several weeks before Halloween. Every evening when the parents got home from work, we would go with them to help get the house ready to be haunted. The heavy work was done by the men of the club; hammering, sawing, painting and more, while we kids helped with odd jobs such as carrying off debris or getting nails and tools. This was a lot of fun and our work with the parents gave us a big advantage over the other kids in town; we knew where all the scary stuff was going to happen. There is nothing quite as fun as watching the “big kids” get the crap scared out of them while being chased around by a man covered in red food coloring and brandishing a de-chained chainsaw under the effects of a strobe light….but this was all just the preliminaries to the night of Halloween itself. 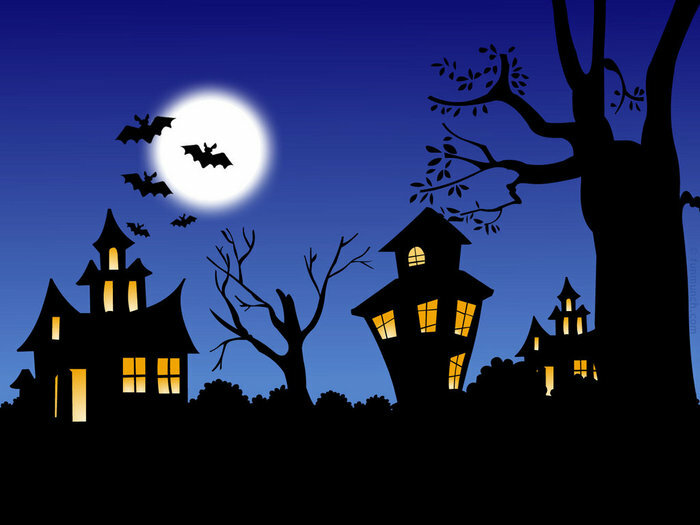 Halloween night was the most fun of all because the neighborhood kids would all go trick-or-treating together in one pack from house to house and each year there was always something different. The weather was always a factor; it was either still warm and you burned up in the mask and costume or it was cold and you froze because you just couldn’t wear a coat over your costume. Batman wouldn’t be caught dead wearing a coat after all. Navigating around was also a challenge because the mask cut off almost all of your peripheral vision so you had to turn your head a lot to see what was on either side of you. We honestly looked like a bunch of bobbleheads walking around. Worst of all, as you breathed through the tiny nose openings in the plastic mask, your breath would condensate on the inside surface and start dripping down your face. You didn’t dare remove the mask to wipe it out for fear that this would be the time the rubber band would break and there wasn’t anything worse than trick-or-treating while holding your mask to your face…it kind of ruined the whole superhero effect. Our parents would take us early to my grandmother’s house a few miles up the road and we would “trick-or-treat” her and my grandfather and get a picture made; then they would take us back to do it all over our own neighborhood. We would hit every house on the street, banter with the parents on “door duty” who pretended they couldn’t figure out who we were behind our masks (never thinking that our parents standing back behind us might give it away) and receive our reward. We knew to say thank you to everyone, especially since we knew the neighborhood kids got better treats than those doled out to the others. Finally, we would make our way back home, masks now in hand (funny how good the night air smelled after you took the mask off) and plastic pumpkins loaded down with enough candy to make you sick. Once there, we got to pull door duty as the older kids and teenagers made their rounds to get all the free candy they could take. The final ritual was pouring all the candy out on the bed to see how good a year you had. These were all a part of the memories of Halloween that I will always have to enjoy. Times have changed since those Halloween’s of the past. For many years now, our local businesses have hosted Halloween on the downtown square, making sure that each station (store) has enough candy to give to every child that comes by. They start lining up in the late afternoon and some years I have seen the receiving line stretch a block past the square as it slowly moves through the area. While this has been a tremendous success, it has had the unfortunate side effect of shutting down much of the neighborhood trick-or-treating that used to happen. It’s surely a lot safer, I’ll agree. The candy is single sourced from one vendor, the police keep the streets closed to cars and the revelers confined to one general area….but it’s not Halloween the way I remembered it to be and there is something a little sad about seeing kids all dressed up in their costumes standing in a long line to get candy instead of running up to front doors and getting to yell “Trick or Treat!”. I guess what is really sad about it is that they don’t know that they’ve missed out on anything because it has always been that way during their short lives. Area churches have stepped in and begun to sponsor Halloween carnivals for kids where they can be safely on church grounds and have fun and games as well but still, it isn’t the same. I like our family’s current tradition best of all. For the past few years, we have taken our son to a friend’s house in a nicely secluded neighborhood near the lake. Other parents and their children converge there as well and we all enjoy a festive meal together as the sun goes down. When darkness has fallen, the parents all load up on golf carts, the children on a hay wagon and we caravan around the looping two-mile road from house to house. We see how much effort the homeowners put into it, often spending days decorating their yards and driveways and we know how much they look forward to this night as well. At each stop, we watch over them all, enjoying their excitement and the joy they experience as they run at full speed from the wagon to the front doors, wearing a variety of colorful costumes, yelling “Trick or Treat” and generally having the time of their lives. It makes for wonderful new memories for us as parents and though a small part of me misses the fun of doing that myself, it is much more enjoyable seeing them have all the fun. More than that, it makes me happy to know that each one of them will remember these Halloween events for the special, if fleeting times that they are. Have a Safe, Memorable and Happy Halloween!